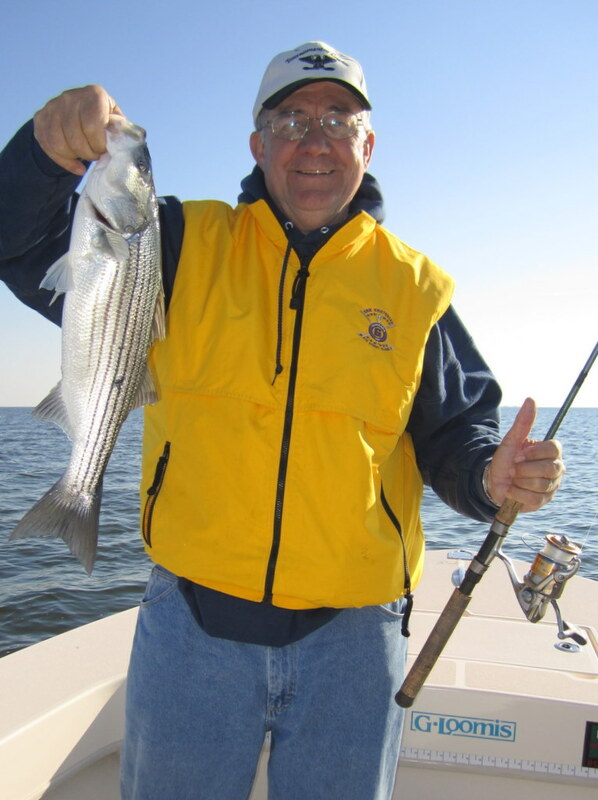 We have switched to full rockfish-mode here on Tangier Sound and fishing has been very good when the wind allows us to get out. 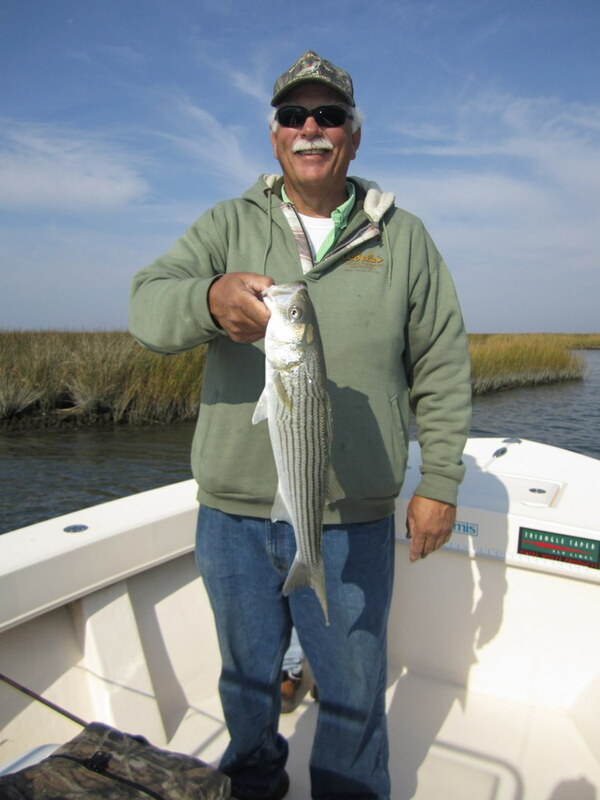 While there are still a few rock swimming the creeks of Smith Island, as they search for killifish and small mud crabs, the majority of stripers have schooled along the edges of the sound’s deep channel. Look for bird activity – gulls, pelicans and diving gannets – to signal feeding rockfish. 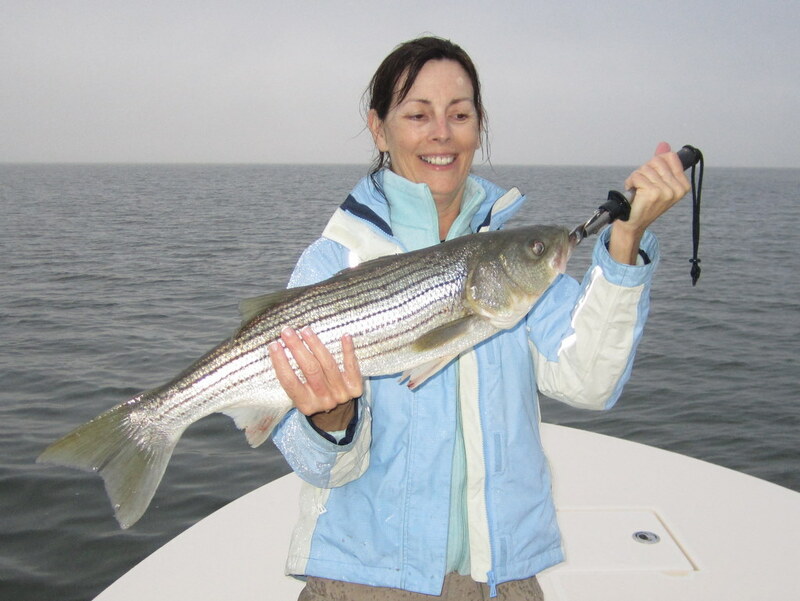 While most of the rock have been running 18″ to 26,” the occasional fish over 30″ is always a possibility. 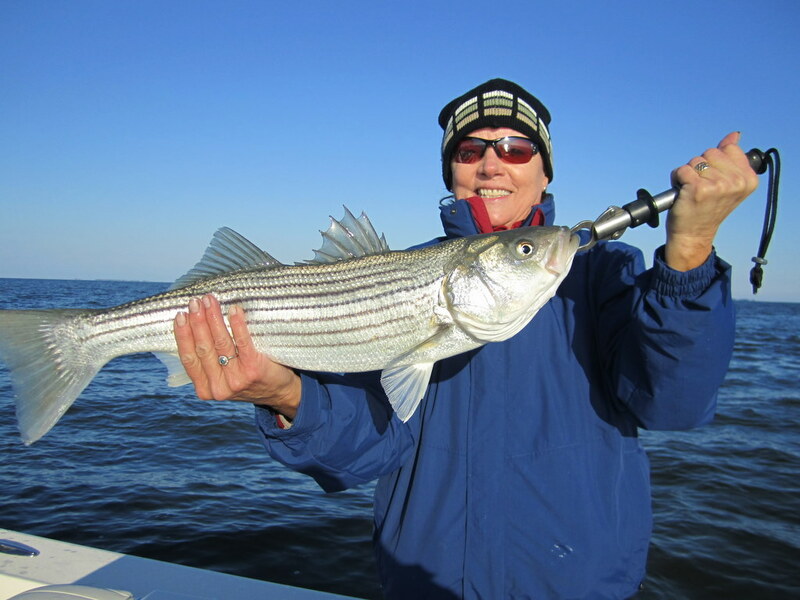 This run-and-gun fishing should last through mid-December, but you need to bundle-up. Enjoy some snapshots of ‘Fall on Tangier.’ My best always, and have a Happy Thanksgiving! "Paul's Fly" was the ticket! 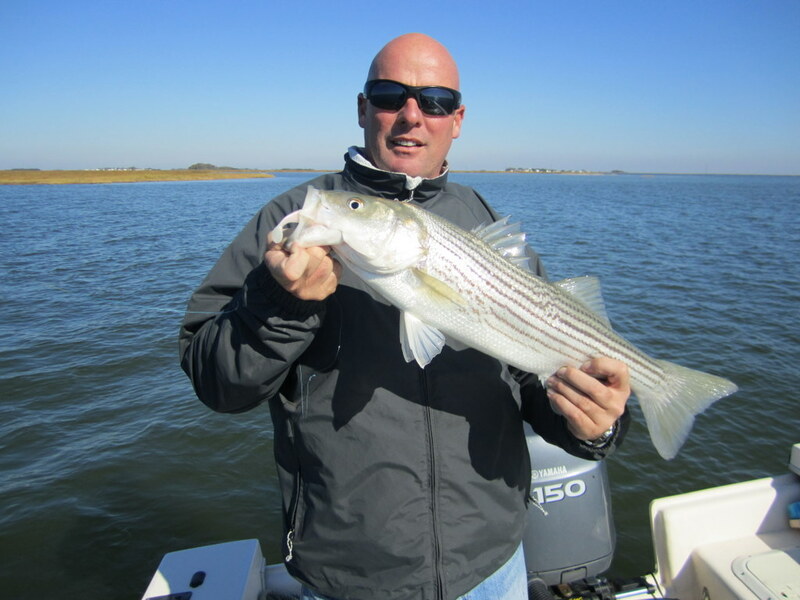 On Halloween day, Jack McKenna had a special morning while looking for rock in the tidal creeks of Smith Island. 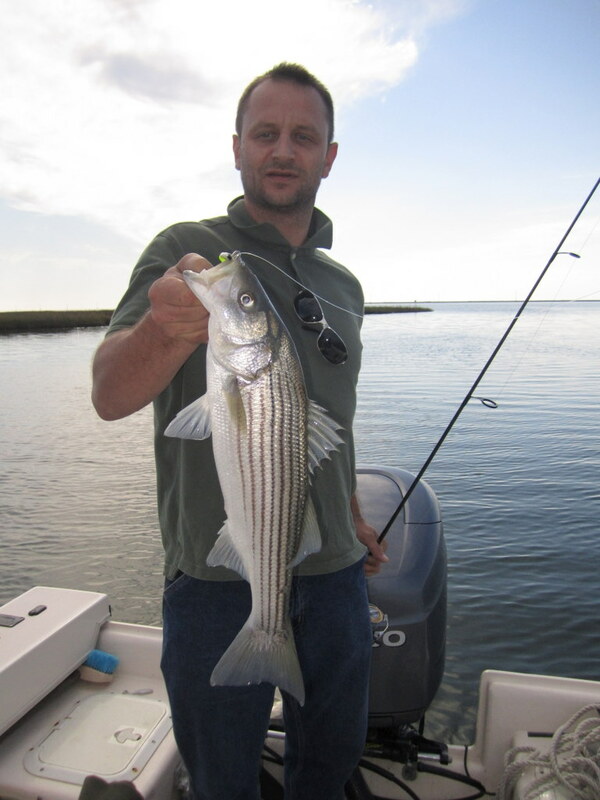 After a dozen or so nice stripers at our very first stop, we rounded a bend only to find rockfish exploding on the surface along the edge of a shallow flat. Jack tied a small popper on his 8 wt. 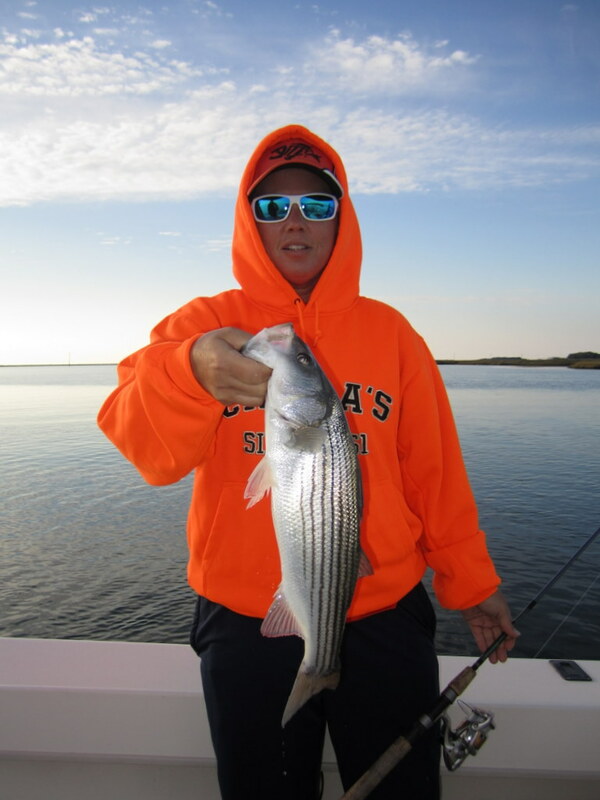 and for two solid hours had rockfish from 18″ to 23″ jumping all over his topwater offering! Fly fishing doesn’t get any better than this!! 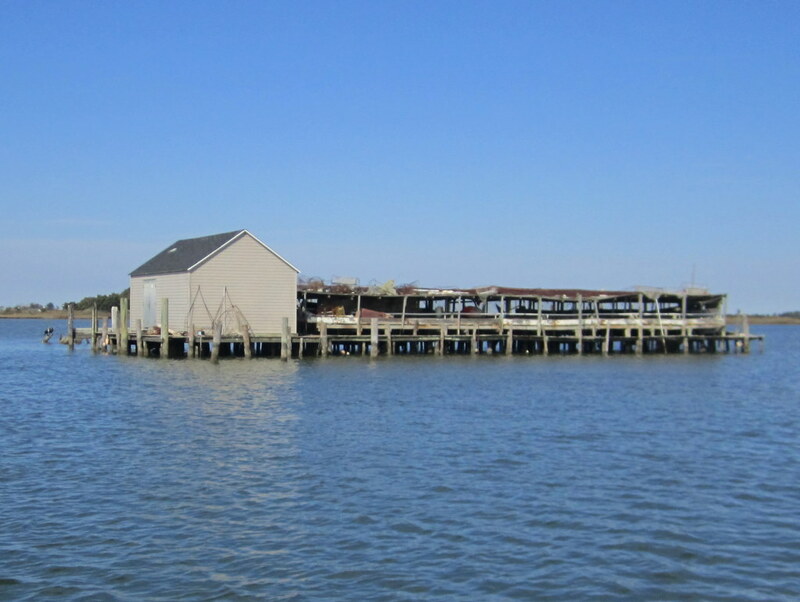 A trip out of Madison on the Little Choptank yielded acres of breakers for Margaret and Doug Worrall and long-time friend Ann McIntosh. Fall is where the fish are!! Tom Weaver, Dave Wood and Nick Shuck, USMC Col. 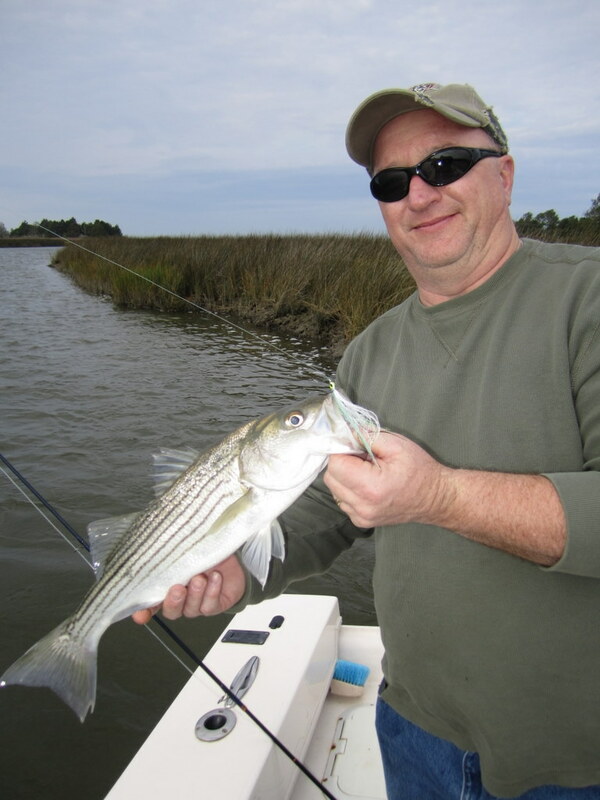 Ret., enjoyed a beautiful fall day fishing the creeks and bayside shorelines of Smith Island. 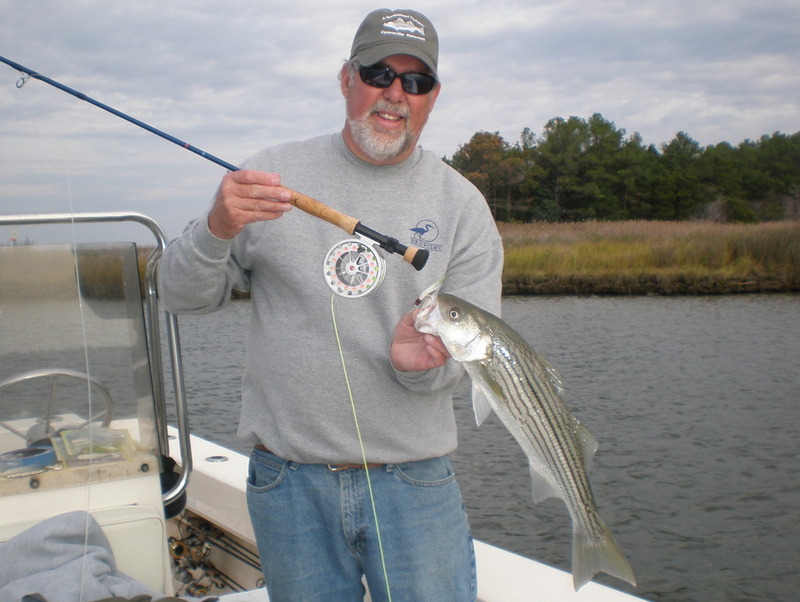 One secluded spot in particular brought a flurry of action with bigger stripers that kept this captain hopping like a barefooted kid on a hot tar road. October usually provides me with a day off here and there, what with the odd cold front pushing its way through. Well, beginning on the 19th a strong front kept me off the water for three straight days. I thought this just might do it for the specks, as we had some fairly cold nights mixed in with the wind. See the results for yourself..
Saturday, October 22 – I moved north a bit and met Tom Hylden and Shelley Davis in the small town of Nanticoke on the upper portion of Tangier Sound. This is a short portage for Tom and Shelley, as they wanted to tryout the fishing closer to home. We fished the shallows of Fishing Bay, Bloodsworth and Holland Islands. A cold morning it was..
Sunday, October 23 – Keith Campbell and Bill Martin flew into the Salisbury airport where I picked them up for the thirty-minute trip to Crisfield. We spent a beautiful fall day on Tangier Sound casting shads and Bass Assassins to the stumpy points and creeks of Smith Island. 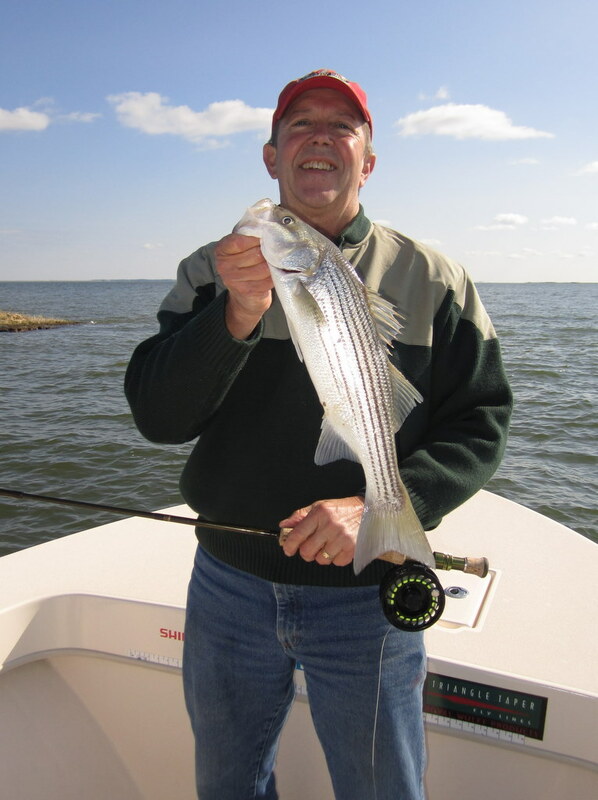 The morning started off a little slow, but as the tide ebbed in the afternoon the fish came alive and both Keith and Bill had good success with stripers to 24″ along with five speckled trout. Looks like the specks might hang around a while despite the cooler water. 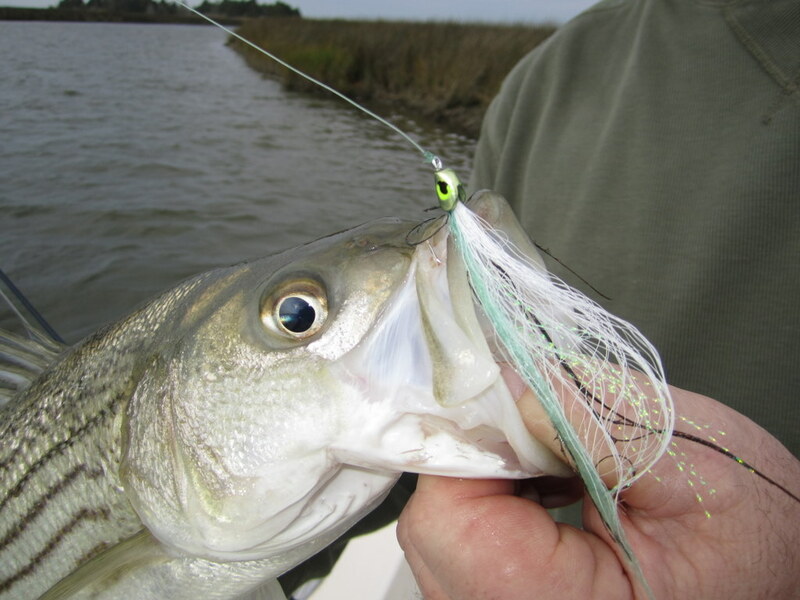 Josenhans Fly Fishing ~ Specks Go Out With A Bang! 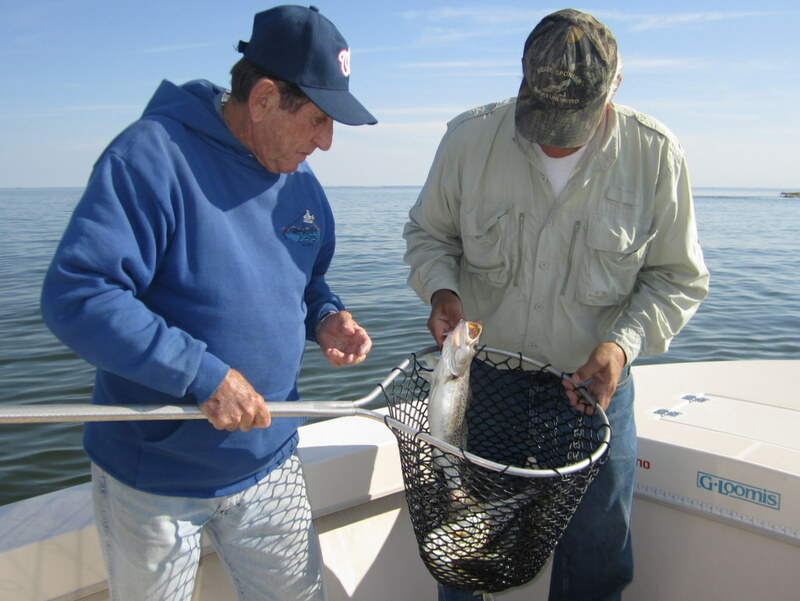 This has been some year for speckled trout on Tangier Sound. Perhaps the best in ten years. 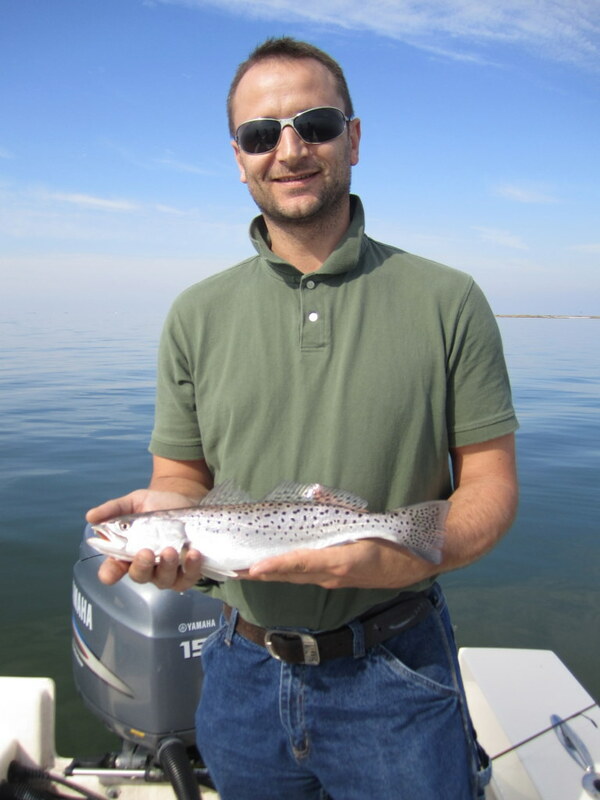 There seems to have been another successful spawn this season, with many juvenile fish showing in fishermen’s catches, so I’m cautiously optimistic that the speckled trout population has returned to its once great levels. The final test will be a good 2012 spring season. 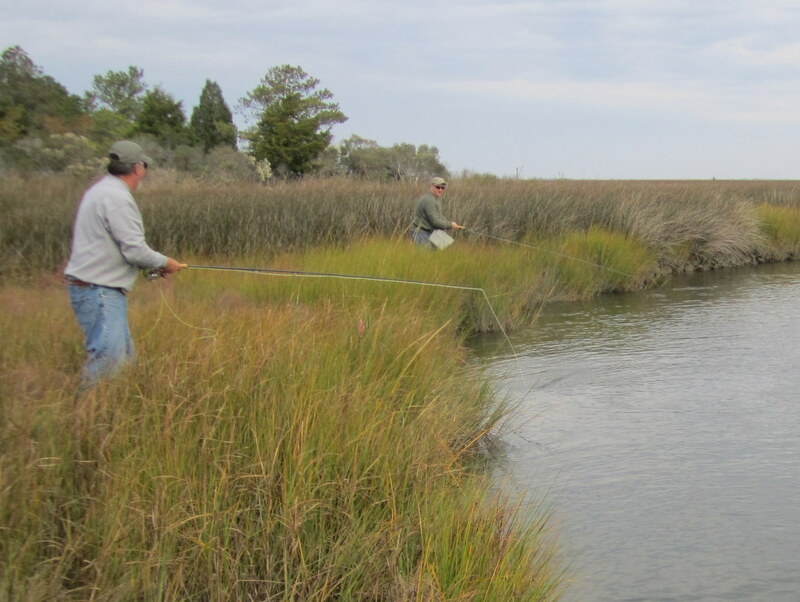 Lets hope that come May of next year, when the water temperature reaches that magic 62 degree mark, everyone’s favorite trout will once again cruise the grassy flats of Tangier Sound. 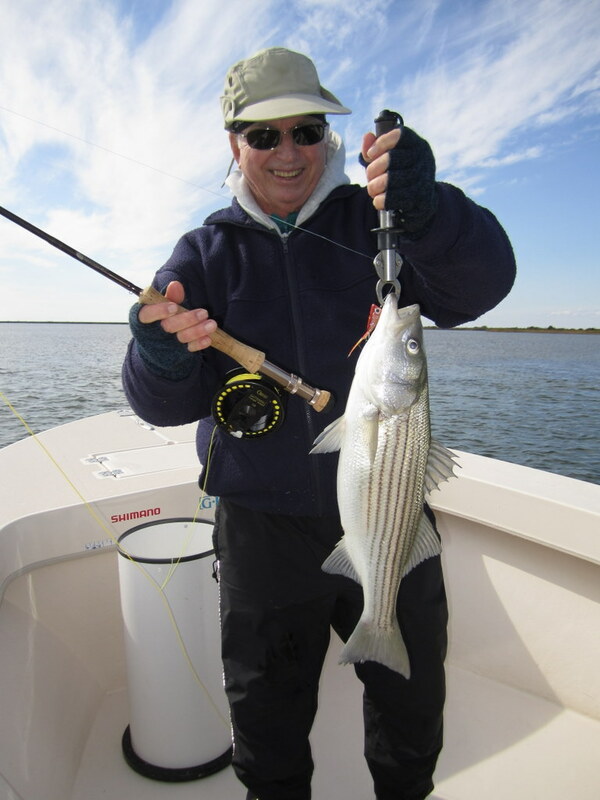 Thursday, October 13 – Michael Avara and Mary Norton booked me for a half-day morning trip and enjoyed good action with rock on poppers to 6-1/2 lbs. 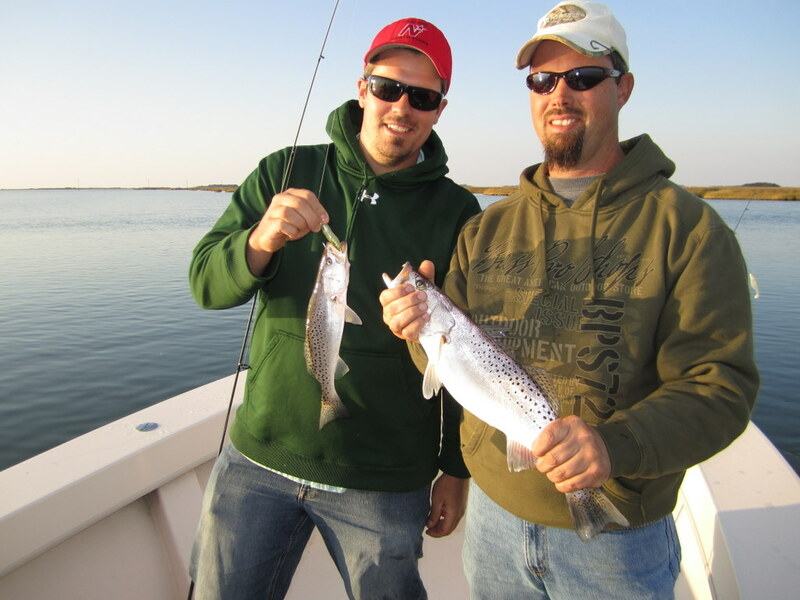 along with eight speckled trout from 16″-19.” Nice mornings work! 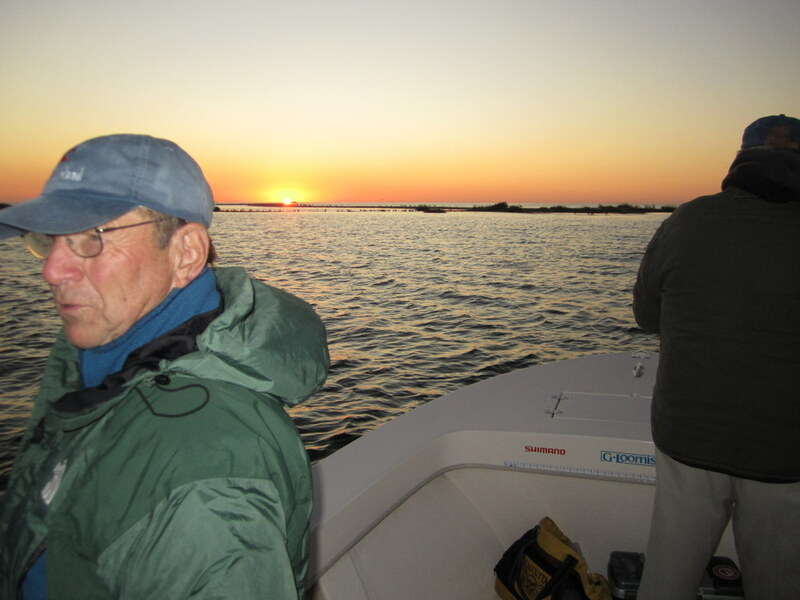 Monday and Tuesday, October 17 and 18 – Just as sure as the Monarch butterfly migration every fall, Maurice Klein and Gene Jones show up every October for a couple of days fishing. Well, fishing and eating Smith Island crab cakes. 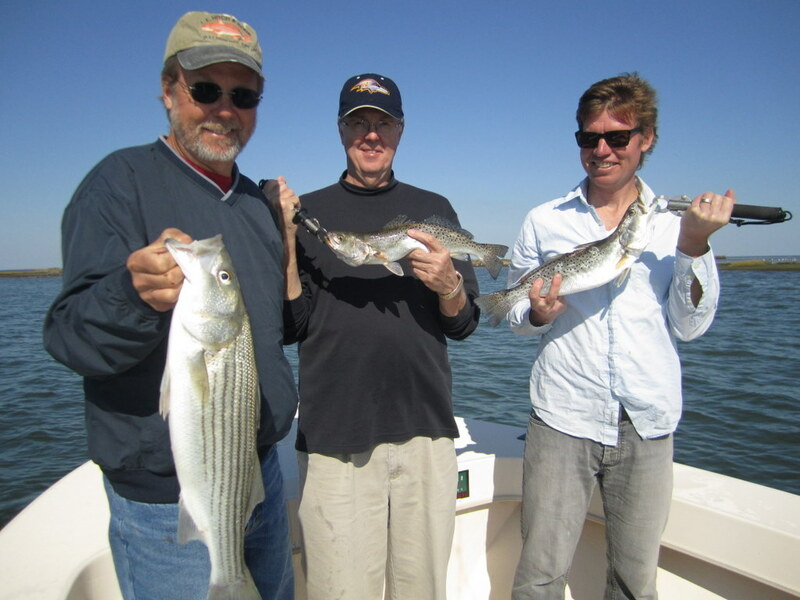 This year was no different as I enjoyed two beautiful fall days fishing with old friends. Monday was record-day, as Maurice and Gene eclipsed the existing two-person, single day record for the season by boating 32 speckled trout. 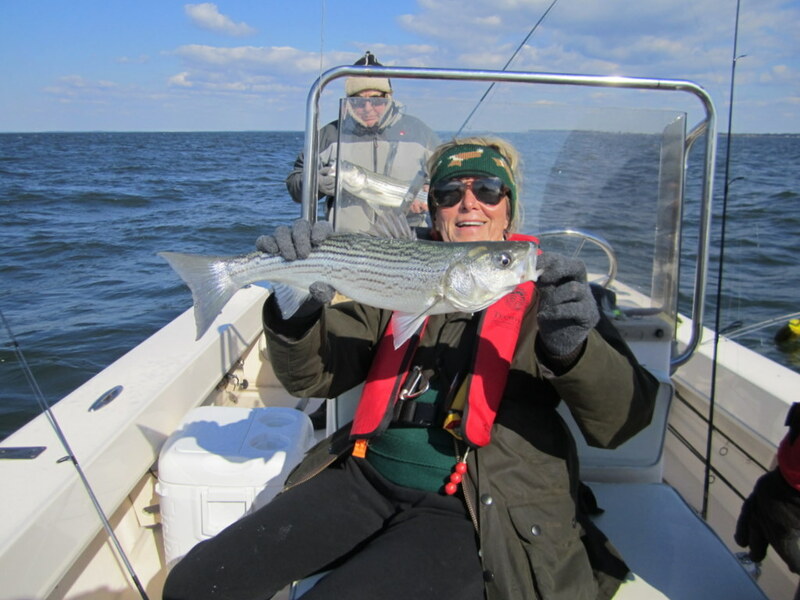 The trout averaged 16″ to 21.” Tuesday was for stripers, as we chose to concentrate our efforts on bagging a creel limit of rockfish. 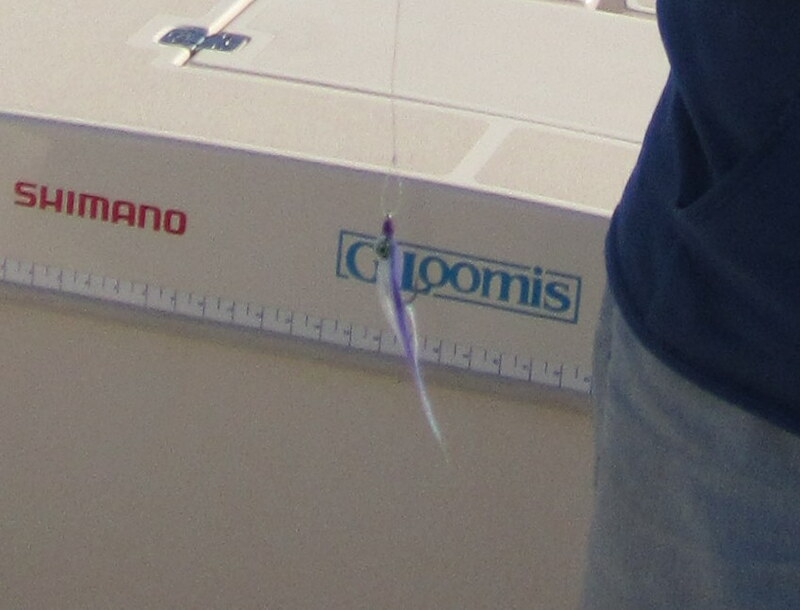 We succeeded, and then some, as we played catch-n-release for the remainder of the day. Another nine specks were added to the mix for a two-day total of 41 specks. Nice work guys! Friday, October 7 – Paul Anderson, his son Matt, along with Paul’s brother Mike joined me for a day chasing rock, blues and specks. At daybreak we had rock to 26″ on poppers, hard-fighting blues to three-pounds mid-day and ended with a speck apiece ranging from 18″ – 20″ for three Tangier ‘Slams.’ It doesn’t get any better than this! 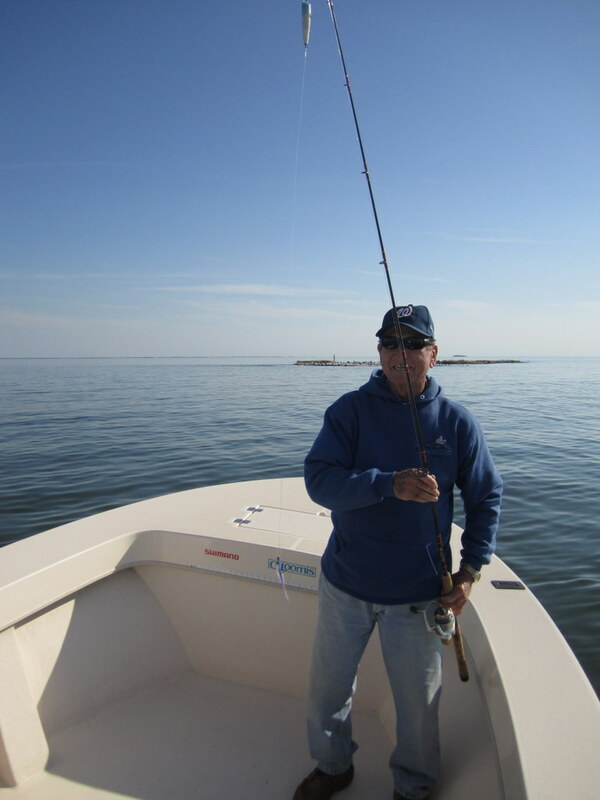 Saturday, October 8 – Chris Cianci, Chuck Prahl and Don Cochran took a break from their home waters on the Choptank River to put Tangier Sound to the test. 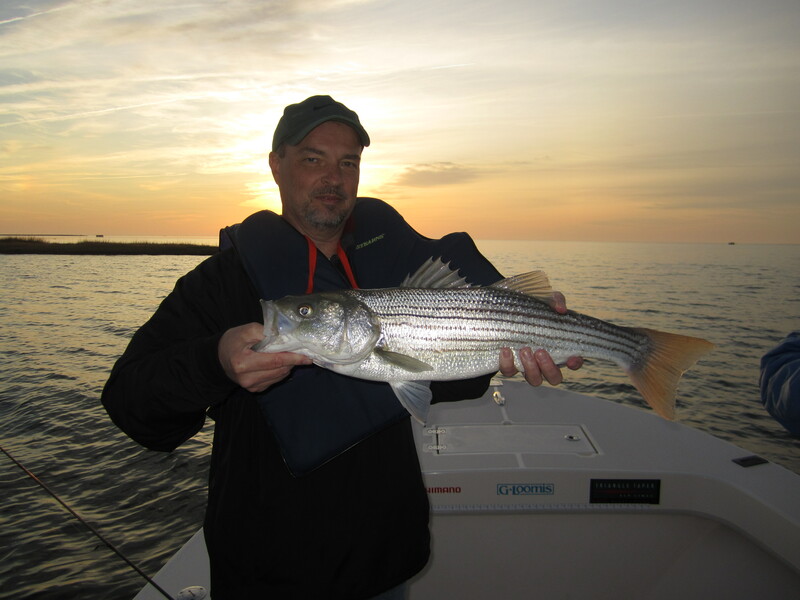 We began the day with some topwater rockfish action, with many more blow-ups than hook-ups. 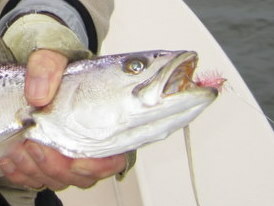 Sometimes rockfish aren’t very good at eating poppers. The excitement of the strike though is well worth the effort. 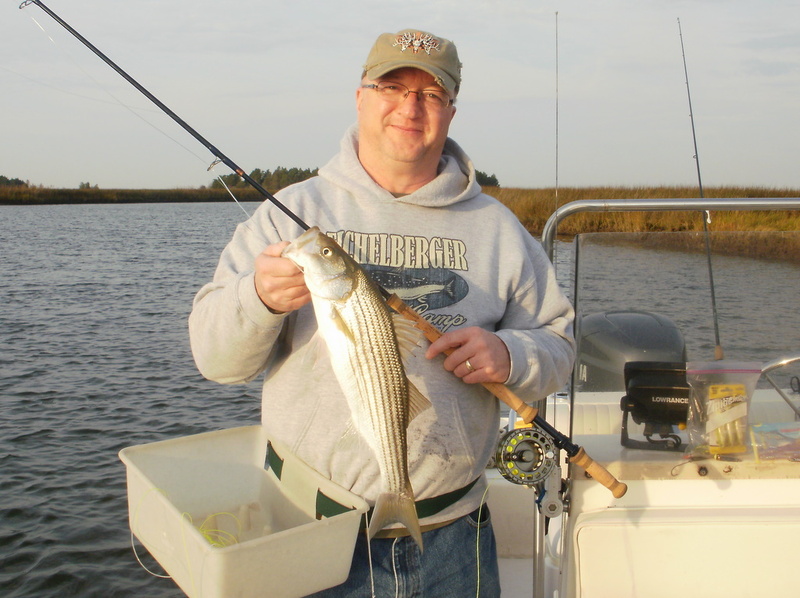 The surface action was interrupted when Don switched to a 4″ shad and began to hook speck-after-speck. It didn’t take long for the other guys to take the hint and soon all had boated a nice speck or three to 21.” Final tally on the specks was eight. I think we could have done much better were it not for the super pretty day, light winds and an abundance of Saturday boat traffic. 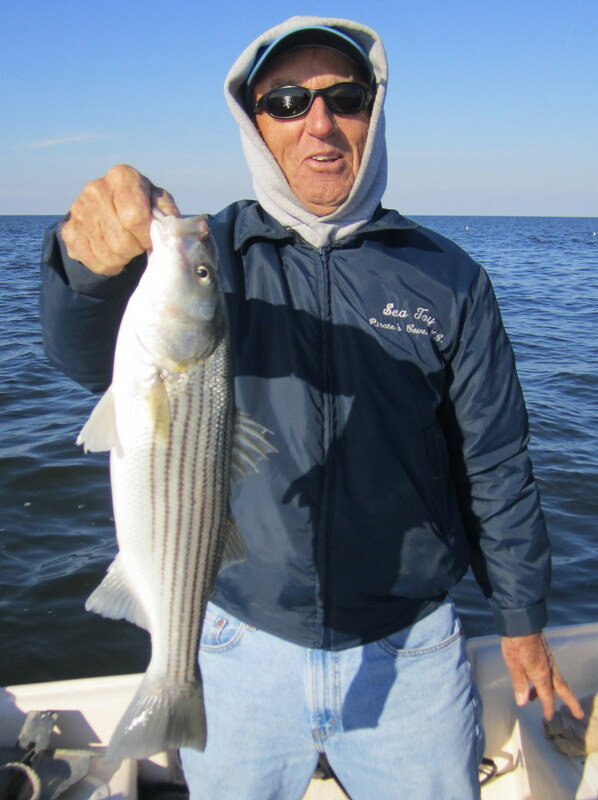 A guide’s gotta have some excuse..
Monday, October 10 – Ed Roach, Doug D. and David Blorstadt enjoyed great daybreak topwater action on stripers up to six-pounds. 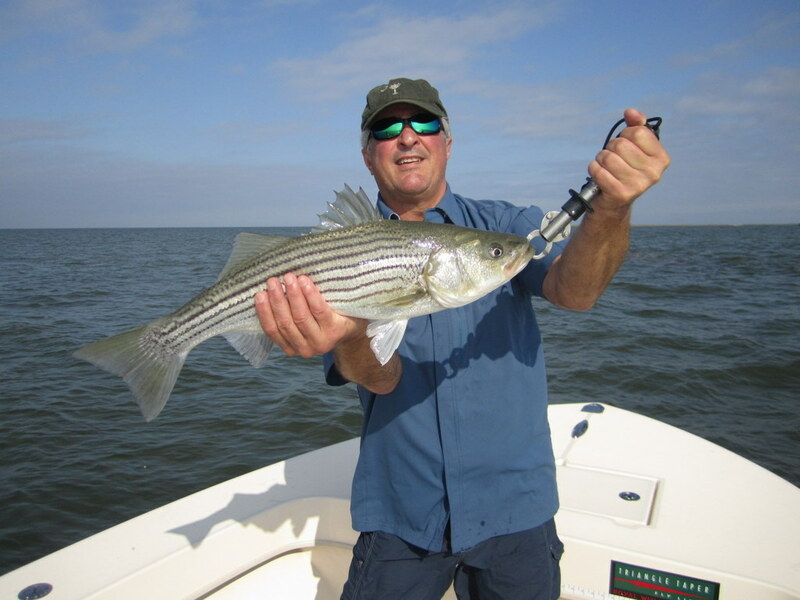 The shallow-water rockfish really put on a show, smacking the Storm and Stillwater poppers all over the sound. The action died once the sun came up so we turned our attention to blues. While the size of the blues has diminished, there was just enough action to keep the guys entertained. After the blues quieted down, we went speck-hunting. 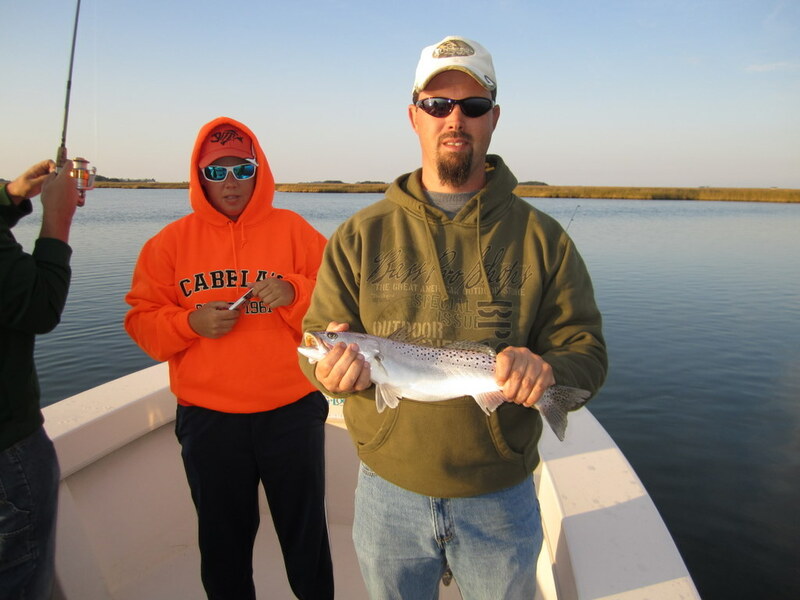 While playing hard-to-get, we did land a few nice specks, with Doug’s 22″ beauty the prize of the day. We picked at school stripers for the remainder of the day while enjoying good weather and conversation. Three nicer guys you could not fish with. 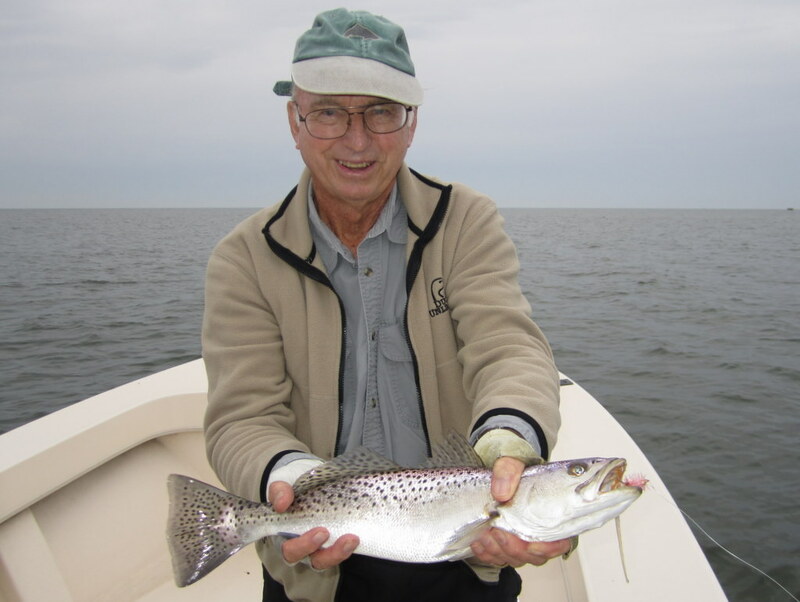 Tuesday, October 11 – Jack McKenna had a day to remember with speckled trout. Overcast skies, calm winds, clear water and plenty of spotted fishes! To top it all off, Jack is a fly fisherman, and an eight-weight was his weapon of choice. 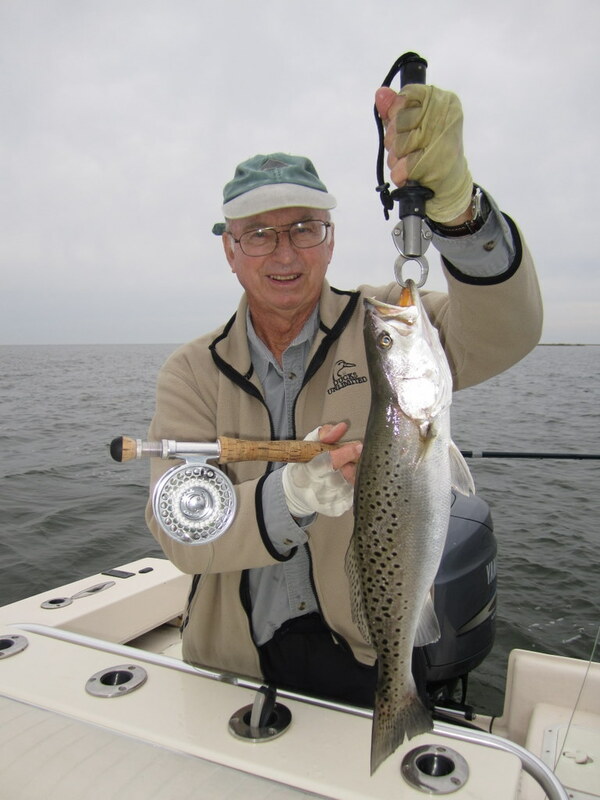 Specks jumped all-over Jack’s pink Cactus Striper as he boated 22 trout to four-pounds! To date, a 2011 high for my boat. 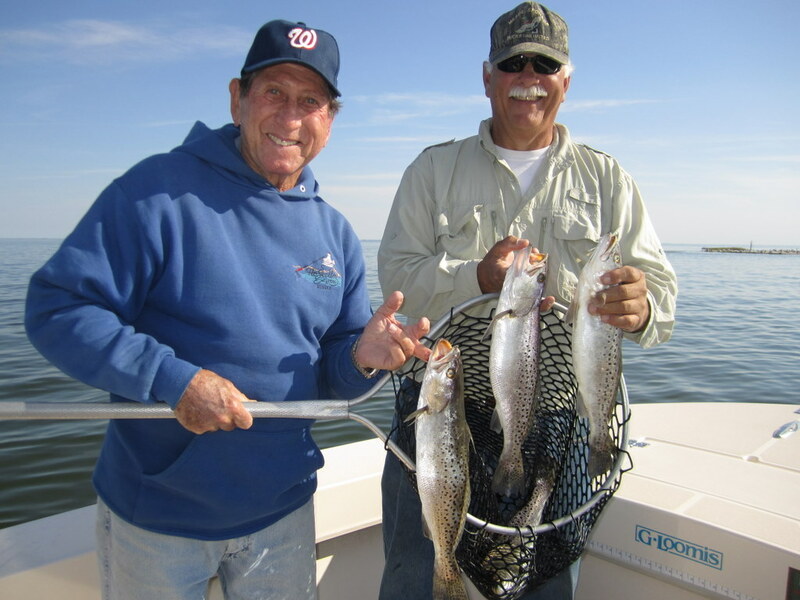 Great job Jack, and be sure to tell your son in Florida that speckled trout fishing is alive and well here in Maryland..